Using the lens of John Dewey’s philosophy, Audun Mollan Kristoffersen’s article shines a light on something that Playback Theatre practitioners are familiar with in practice and training: the circle, a physical embodiment of Playback Theatre’s commitment to inclusiveness and equality. These quotes are from my teachers Jonathan Fox, Veronica Needa and Aviva Apel-Rosenthal at a Playback Theatre Leadership workshop in Hungary in 2013. The ritual of starting and ending in a circle is well known for us who do Playback Theatre. It is easy to think, “Why stress so much to get the circle round, isn’t this egg shape good enough?” or “Could we just start with the exercise instead of working on getting this circle right!” I have probably had those thoughts myself at some point. In this article I will look at why getting the circle right is important in Playback Theatre, and what this could tell about its essential character. The question I am investigating here is this: Can the circle as symbol say something essential about Playback Theatre, through the optics of John Dewey’s theoretical experience perspective and through the term inclusion? In Playback Theatre ritual is one of the pillars that the work is built on (Fox, 1999). In Playback Theatre workshops or rehearsals we often use the ritual of meeting and ending in a circle. Many of the exercises also have a circle as the starting point, so one could say it is embedded in the learning of Playback Theatre from the start. Here in this article, I will focus more on the circle as a symbol. Therefore I need to define what I see the circle as here. When children are playing actively different shapes come up spontaneously. The first one is a circle (Slade, 2001) showing how deeply rooted the circle is in us as human beings. A historical interpretation of a circle as a symbol is that it represents the wholeness of life and harmony, or the self’s pursuit to become one with the other (Granbacka, 2013). It is this meaning that the symbol of the circle will have in this article: wholeness of life, harmony and the unity of different selves. However, to investigate the research question related to the symbol of the circle I need a broader optic, theoretical “glasses” that could help me to reflect on how this tells something essential about Playback Theatre. 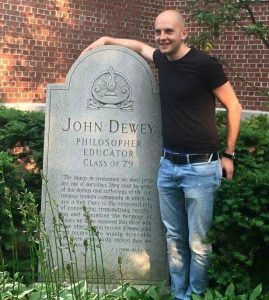 To find this optic I need to travel more than 350 km north from New Paltz, where Jo Salas and Jonathan Fox live, specifically to Burlington in Vermont where the philosopher John Dewey was born in 1859. His place of birth influenced the philosophy that he later developed. Vermont was the first state in the US to take a stand against slavery in 1775, and local democracy through community halls has had a significant role (Nørstebø, 1953). John Dewey is one of the best known pedagogical pragmatists. Pragmatism is a philosophical approach that claims that the connections between theory and action are crucial both for the theory’s truth and the validity of the action (Egidius, 1998). Philosophy is seen not as an aim in itself but to be used to build better societies. Within the pragmatism frame, Dewey worked as an active citizen, lecturer and writer from 1882 to his death in 1952. He is well known within the pedagogical field, but his philosophical contributions are broad. Dewey wrote about psychology, ethics, experience, transformation and democracy, to mention some (Eikseth, 2008). A shift in his focus occurred when in 1934 he wrote Art as Experience. Dewey was over 70 years old and had made massive contributions around how to create better societies and how to create democracy as a form of living. In 1934 he then placed art and emotion in the centre of his philosophical horizon (Rasmussen, 2001; Rasmussen & Kristoffersen, 2011). With this, he also expanded his theoretical frame on experience. I will explain why this is interesting from a Playback Theatre perspective. I was at Hannah Fox`s workshop “The Articulated body” in Belfast in 2008. It was a period when I had difficulties with integrating all the different parts of my life. It was a strong experience. On the plane back to Trondheim I wrote in my notes: “Playback is not just a thing I do, it is what I do”. It changed how I looked at my practice in Playback Theatre. It went from being a hobby to a core part of my identity. It was an experience. Through Dewey, one could understand that meaning in life unfolds through transformative experience and the expression of that experience. To make that possible one has to grow and to seek growing (Dewey, 2008). To create an experience, one has to meet the obstacles or challenges one encounters in the environment and work with them, just as an artist does when they create art. The artist creates and encounters (or undergoes, in Dewey’s term) the material again and again, until one day the piece of art unfolds itself. It has found its expression, an experience. In Art as Experience (1934) Dewey speaks of emotions as “the glue” that makes all the prior moments come together, that connects them in a continuing line of moments to find its form. This “glue” is created by something that Dewey calls aesthetic quality. The more emotion there is in the process, the more aesthetic quality the experience will have. This quality is created by the “doing” and to the “undergoing” (1934, p.52). I was in Playback Theatre Leadership in Germany 2009. I told a story about a conflict I was experiencing. Jonathan responded, “You may be right in all that you say about the situation, but you have to relate, Audun.” The “relate” comment struck me because it was true. My story was something that had happened to me, but I had not taken an active role to engage with it. I had not been undergoing the situation. I was hiding in a passive position. There was no transformation. It was not an experience. After sharing this experience at Leadership and through Jonathan’s comment, I started to engage with that conflict, and that changed my approach to what happened. By relating to the emotions that can come up when one fully encounters or “undergoes” something the aesthetic quality leads to what Dewey calls the continuity principle, moments that are connected. This is in sharp contrast to how Dewey has been understood through the quote “Learning by doing” (Kristoffersen, 2010). You do not learn by just doing. It is through the relationship between the self and its surroundings in a continuing process that one learns, develops and unfolds–or makes an experience, as Dewey calls it. The way one creates experience is, therefore, a transformation where old material comes together in a new form. How we make experiences in our lives is thus made in the same way as an artist makes art or aesthetic experience. The only difference is in the material one uses. An aesthetic experience can be crowded into a moment only in that sense that a climax of prior long enduring processes may arrive in an outstanding movement which so sweeps everything else into that all else is forgotten (Dewey, 1934 p. 58). Since experience is built on the material of previous experience and sweeps it into something new, an experience is, therefore, a transformation that gives meaning to the struggle one has had along the way, as long as one comes through it. Consequently, in Dewey’s view, to make experiences is the most significant form for growing a human being could have because one experience is built on all other experiences (Hohr, 2016). Experience is created within a context, and it unfolds itself within a context. Since experience is built up in relation between the self and the environment, it is not just individualistic. It concerns the self in the world, but also affects the world the self finds itself in. It is a circular process. We can sense an experience when it happens: it hits the whole body. It carries meaning, creates a harmony, a feeling of wholeness, and unity between people (Hohr, 2009; Hohr, 2013; Hohr, 2016). One example. The man told that his brother, who was seventy-nine years old, was out with some colleagues at a restaurant five days before. Food got stuck in his brother’s throat, and he was without air for fifteen minutes. He had been at the hospital in a coma since. “I just got a phone call from the hospital,” the man said. “My brother is going to die tomorrow because his life cannot be saved”. That was the story, and we chose our most abstract form, “Poet, dancer or musician” to play it back. I felt heavy when I got up to take the poet’s place and hadn’t any clue on how I was going to express his feeling poetically. Together with my Playback team, we started to create something, and I felt an emotional flow take over from my initial uncertainty. After we had played it back, there was silence among the audience, but the man came up hugging us. He left before the performance was over. The day after I looked up his number and sent him a message checking in with him. An hour later he replied. He thanked me for the message, and wrote: “My brother died an hour ago.” After acting in his story about his brother the day before, it seems that I had sent a message at the same moment that his brother went “out of time.” Later I learned through others that the teller was grateful for the playback that evening. The performance became like its theme in a way, an encounter when it is darkest. For me, and I am sure for some others as well, it felt strong. I would consider it an aesthetic experience. Linking it to what I have been writing about Dewey, the experience hit my body, I had a feeling of wholeness, and after I sent the message the day after I felt a profound unity when I received a reply from the teller. In other words, it felt like the definition of the symbol of the circle. Just like the Playback Theatre experiences I shared, one experience opened into another one. For me, it relates to the symbol of a circle. Dewey’s theory on experience can be understood as creating bigger and bigger circles around oneself in the world. Just like the concentric circles that are created when one throws a stone in the water, the second circle, or experience, could not exist without the first, One experience lays a platform for a new one, a transformation of what has happened before. In other words, it is a Playback theory on how to understand when one breaks or creates the narrative flow in a particular context. I will not go into depth on the theory because Jonathan will do that himself, but I will focus on one aspect of it, the atmosphere of inclusion. There are many various definitions of inclusion, from school contexts and societies to more action-based theories. Two Norwegian scientists have developed a theory on how to promote inclusion. They suggest there have to be four areas that work together if inclusion is to be created. 1) Democratization: everyone must have the opportunity to be heard. 2) Participation: space has to be created in a way so people can participate actively. 3) Benefit: the persons that are attending have to feel that they benefit from what is happening, because benefit creates meaning (Bachmann og Haug, 2006; Haug, 2004). 4) Community: the community that is built on the three other areas will create a felt community, not just a community built on narrow interests or community defined as just people together (Kristoffersen, 2010). This theory fits very well together with a new Norwegian theory on bullying and exclusion. This theory says that bullying or exclusion is “actions from adults or children that prevent the experience of belonging, of beinga significant person in the community, and the possibility to contribute” (Lund, Helgeland & Kovac, 2017 p. 14, in Audun Mollan Kristoffersen’s translation). Both these theories relate to the symbol of a circle, as I see it. Everyone must have the opportunity of being part of the circle, and a special atmosphere is needed in order to create that. When that atmosphere is not present, a sense of inclusion cannot be created. So what might these the theories about inclusion and exclusion, as well as Dewey’s theory on experience and the symbol of circles, tell us about Playback Theatre? As in Dewey’s theory, Playback Theatre builds on experiences. Telling a story in Playback Theatre and getting it played back could be considered as undergoing your own story. You often get in contact with your own emotions when seeing your story played back. Dewey’s understanding of transformation, continuity principle and aesthetic experience can also be understood through a Playback Theatre performance. The more connected the moments in performance are from one moment to another, the more range of emotions there will be in a performance. The more this continuity principle is fulfilled, the stronger the transformation will be. This is like the “red thread” of folk wisdom (Fox, 1999, p.128). The “red thread” together with the form and ritual sweeps the process together into what we can understand as Dewey’s term aesthetic experience. “…As the ritual unfolds, and the people get caught up in it, feelings rise, with inevitable consequence that a fully undertaken playback event will be strongly emotional” (Fox, 1999, p.123). The more connectedness and continuity a performance has, the more aesthetic quality it will be filled with. Through Dewey we can argue that a Playback Theatre performance is a form of living democracy, and it has a democratic impact on the society itself. It is the quality of relating in a performance that makes that democratic impact: relating between people, relating as “doing and undergoing,” and relating one moment to the next in a continuing line. However, how can we assess the democratic impact or atmosphere of inclusion a Playback Theatre event contains? Here it is useful to use the two theories on inclusion and exclusion. The more a community is built on democratization, participation and personal benefit in the form of meaning, the more a felt community it will be. Alternatively, if people are prevented from feeling like a significant part of the community, from an experience of belonging, and fromthe opportunity to contribute, then elements of exclusion will be built into an event. I am reflecting on this as I sit in the car traveling from Burlington towards New Paltz after being at the international PT gathering in Montreal, filled both with aesthetic experiences and a strong atmosphere of inclusion, and also some experiences filled with the opposite. Sometimes I felt I was being held in an atmosphere of a “circle,” and sometimes I felt on the outside of a “circle,” or that the atmosphere of the “circle” broke. 1. I as an individual (me) have to relate to my neighbours (the others) on each side of me. 2. Together I (me) and the two others on my side of me create an us. 3. But to be able to create a circle I (me) and the two others (us) must relate to all the different “us”’s that form the circle. It is by relating as a group that we can create a big we, a round circle. It is a complicated process to build a circle because all these components have to be together in one piece; (1) Me, (2) Us, (3) We. The last aspect is that a circle is as round as everyone makes it. Based on the theories on inclusion that I have mentioned, the same counts for inclusion. So just as in a circle, inclusion is co-created: everyone is responsible. In this text, I have traveled from the Leadership workshop in Hungary in 2013, to Burlington in Vermont, to the Playback Theatre world conference in Montreal in 2015, to New Paltz and back to my home in Trondheim, Norway, where I sit and write this article based on my experiences. It has taken me five years to write this after I wrote the first lines: “Keep the circle!” “Is this a circle?” “This looks like the shape of an egg.” On my journey, I have become more and more sure that keeping the circle, literally and symbolically, is not just a thing we do along the way. It is a core element in what we do if we want to create communities. So keep the circle! Because the more round the circle is, the more democracy as a way of living is created. So, keep the circle, keep it! Backmann, K. & Haug, P. (2006). Forskning om tilpasset opplæring. Forskningsrapport nr. 62. Volda: Høgskulen i Volda/Møreforskning Volda. Dewey, J. (1934/1980). Art as Experience. New York: Perigee Books. Berkley Publishing. Fox, J (2017). Narrative Reticulation. An explanatory theory for playback theatre. Unpublished article. Haug, P. (2004). Finst den spesialpedagogiske kompetansen det er bruk for i skulen? Spesialpedagogikk, 5, p. 4-11. Hohr, H. (2009). Å føle, å oppleve, å begripe. En rekonstruksjon av John Deweys erfaringsbegrep. I: Kjetil Steinsholt & Stephen Dobson (eds. ), Verden satt ut av spill. Postmoderne pedagogiske perspektiver, (p. 65 – 77). Trondheim: Tapir Akademisk Forlag. Hohr, H. (2013). Den estetiske erkjennelsen. I A-L. Østern, G. Stavik-Karlsen & E. Angelo (eds.). Kunstpedagogikk og kunnskapsutvikling, (p. 219-233). Oslo: Universitetsforlaget. Hohr, H (2016) Erfaring som menneskets måte å være på. In: Ole Andreas Kvamme, Tone Kvernbekk & Torill Strand. Pedagogiske fenomener – en innføring (p. 98 – 105). Oslo: Cappelen Damm. Rasmussen, B. og Kristoffersen, B. (2011). Handling og forestilling – forestilling om handling. Jacob Levy Morenos teaterekspresjonisme og sosiatri. Trondheim: Tapir akademiske forlag. Audun Mollan Kristoffersen has a Masters in Education (specialising in Drama) from Trondheim University in Norway focusing on inclusion and aesthetics. Right now he is a PhD candidate on the same topic and a special needs teacher at a Primary School where he applies different approaches to learning. He graduated from the Centre for Playback Theatre in 2009. 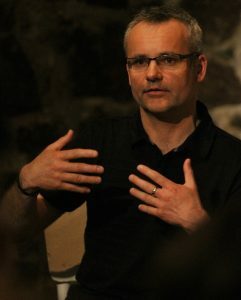 Audun started with PT in 2001 and is currently the artistic director of Teater Momentum in Trondheim. The company has focused on PT research and education. He has also been a part of a research project in Trondheim (Space Me project) that explored different entrances to learning between the arts and sciences. Playback Theatre was one of the methodologies that was implemented during this project with the aim of students interrogating their personal relationship to learning. Besides Teater Momentum in Trondheim, Audun is also connected to Skandinavisk Playbackteater Studio where he sits on the board. …it is true that we sometimes see Playback actors…who are remarkably effective in finding and playing the metaphor, as if they have an intuitive understanding of the necessity of metaphor. It is November, 2001 and the day after I have split up with my then girlfriend (a significant fact, I believe). I am involved in a Playback Theatre workshop and performance in Devon, UK with the company in which I was then a member, Four Winds and Fire. The performance took place in the afternoon and one of the stories was from a young man about his difficulty to be creative in his life and his desire to turn to writing. We had chosen to playback the story in Chorus. We were a company of only three with no musician and Chorus was a form we regularly rehearsed with and one that we felt intuitively drawn to in order to produce good Playback. In the midst of the enactment a whole section of story emerged concerned with the teller going to Africa and the use of feet became a strong feature. The use of feet continued as a strong motif throughout the enactment. As we were performing I could hear his very vocal reaction as we performed this section. He was reacting to the fact that we were playing back, metaphorically, something that had actually occurred but which he had not consciously verbally expressed. It was clear that we had hit upon truth. Following the enactment and in closure, the young man explained how a trip to Africa and living barefoot with indigenous peoples had somehow been instrumental in helping him to turn to a career of writing. At the end of the performance we were going around the circle of participants, witnessing each person’s response to the work before we ate food together. I sat in peace knowing that we had served this small community. As the participants talked about their feeling of having been fed by the work I, myself, sat quietly feeling fully nourished by the stories that they had so generously shared. This was in distinct contrast to the utterly low feeling I had arrived with following the break-up from the previous evening. I was feeling devastated, alone and extremely vulnerable. Only a few hours later I felt that I had done some of my best performance work in Playback and was feeling whole and at peace.